Although it is difficult to diagnose a problem with very little information on how the spa is used and maintained, this issue looks like the same problem we have seen in the past. Almost 100% of the cases involving discolored acrylic surfaces are caused by chemical attack. We have seen many examples over the years where spa owners have used the wrong water treatment chemicals or water fragrances, and it resulted in damage to the acrylic surface. It doesn’t take long exposures to cause the discoloration. The most common culprit in recent history is the chemical “Tri-Chlor” (Trichloroisocyanuric acid). This product is sold in tablet form for swimming pool water treatment. It is the most popular swimming pool chemical sold in stores like Home Depot and Lowes. Trichlor is essentially a combination of Cyanuric Acid (CYA) with chlorine. Dispensers are used in pools to slowly dissolve the tablet. 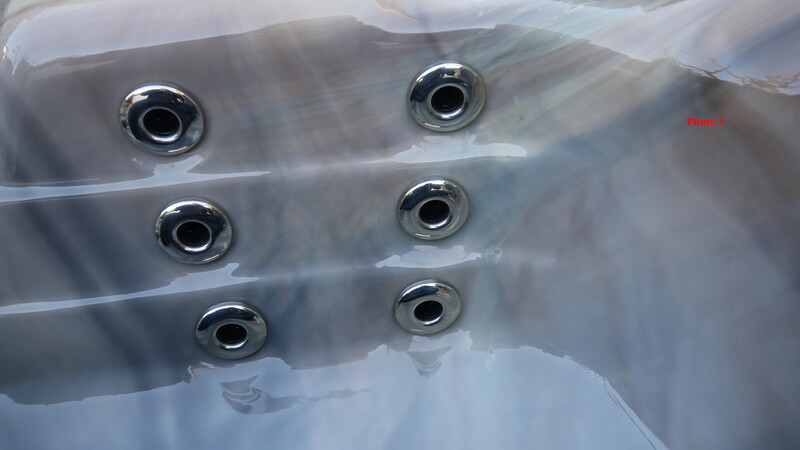 The dispenser floats on the water surface, but in a spa, it normally moves to the water’s edge and rests along the spa surface due to water agitation. So, the acrylic surface close to the tablet is exposed to a very strong acid, which bleaches the pigments. The problem has occurred enough to cause one acrylic manufacturer to conduct lab testing to verify the problem with Tri-Chlor. Their testing has proven that Tri-Chlor can cause bleaching of acrylic pigments. 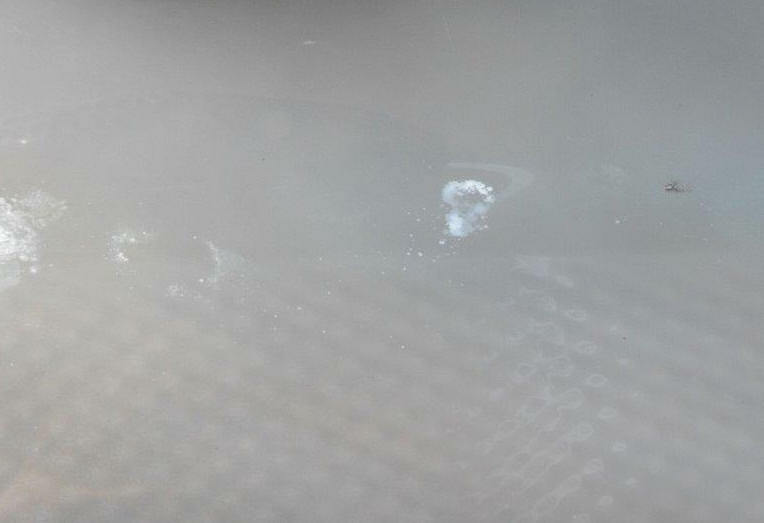 The following photo shows another example of this chemical attack from Tri-Chlor that is from their testing program. The color of the stain depends on the acrylic pigmentation, and influences from other chemicals used in the water. Their testing results prompted them to publish a technical bulletin for their customers, and to produce a label (see below) to be applied to new spas. The label warns the spa owner to avoid Tri-Chlor, and the label should be used by all manufacturers and dealers. Spa owners should refer to their product operation manual or consult with a qualified dealer or the manufacturer to learn recommendations on proper water treatment chemicals to use, and what products should be avoided. Di-Chlor (Dichloroisocyanuric acid), in powder or granular form, is a weaker acid and a commonly recommended product for hot tubs and spas. I hope this helps you, and thanks for trusting us for help. I have attached a photo of a hot tub installed in a hotel. It is a plastered spa, and large chips are coming off of the surface. Can it be salvaged using your FRL System? The quick, simple answer is yes, it can be used to renew the hot tub surface. However, before I give the complete answer on FRL resurfacing of a plaster finished hot tub, I want to address common issues with the practice of using fiberglass coatings over plastered swimming pools. 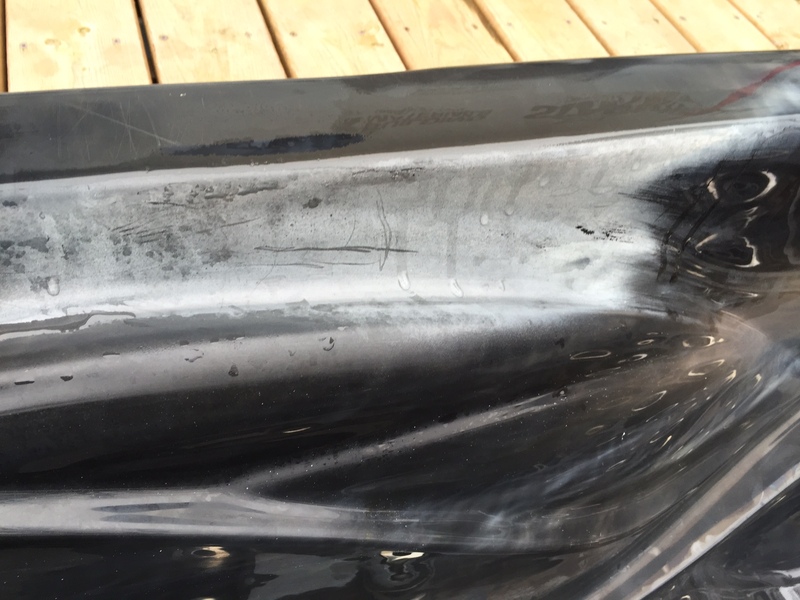 Even though they are the same application, using a fiberglass coating on a plastered swimming pool brings much greater risks for failure than using fiberglass over plastered hot tubs. There have been companies that specialize in a total refinish of pools by applying a fiberglass composite on top of the plaster. Therefore, there are a lot of these swimming pools in service today that have experienced a high rate of failure. Repairing these failed jobs have great appeal to repair technicians. Even complete pool resurfacing can be achieved with our FRL system. The larger the pool, the bigger the job, and bigger the pay check, right? Our advice is don’t be quick to jump for that big pool job. Even though it might appear to be a great business opportunity, it is very risky to re-surface plastered swimming pools. Applying fiberglass resin systems over plaster does not always provide for resolution of the underlying issue, deteriorating plaster. These overlays of FRP usually fail as the plaster continues to deteriorate. 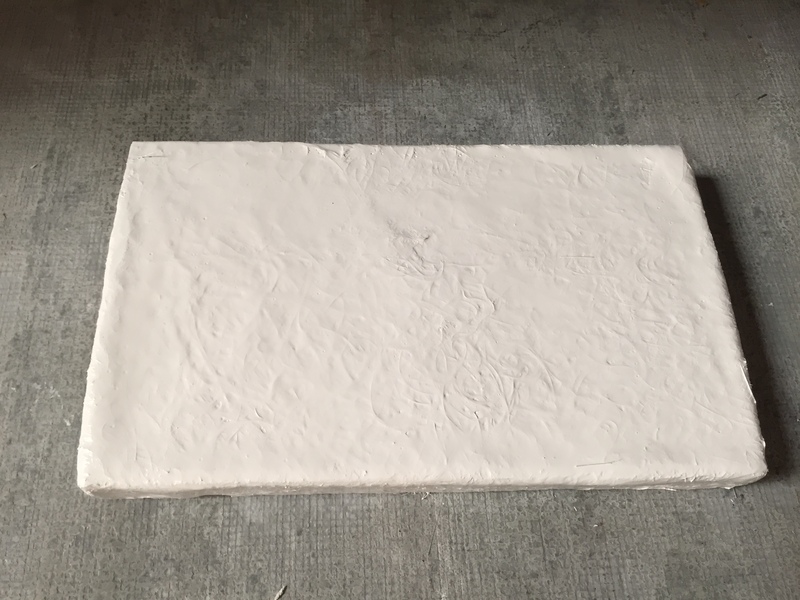 The explanation is that although advanced resins are utilized, and the top layer bond is great, adhesion between the different layers of fiberglass, plaster, and concrete base will decline. This leads to complete failure of the composite structure application. Some resurfacing will lose adhesion in big sections, and some will just have small areas that come loose. 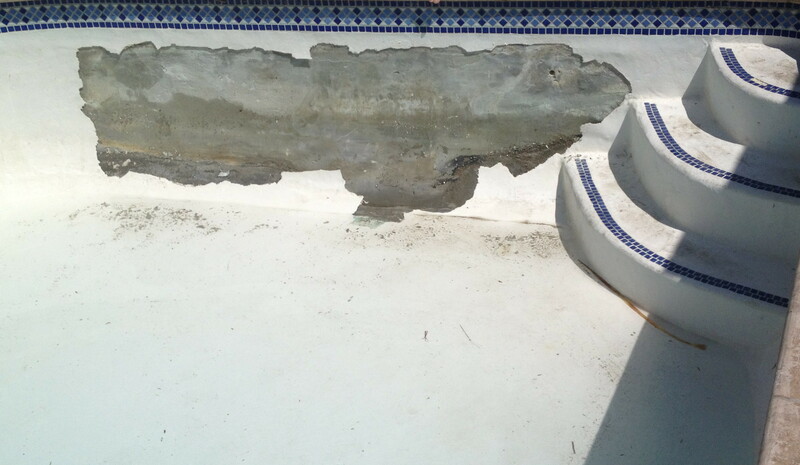 It is best to refer the major failures to a contractor that will completely re-plaster the pool. On the same note, the smaller failures provide the opportunity for repair professionals. 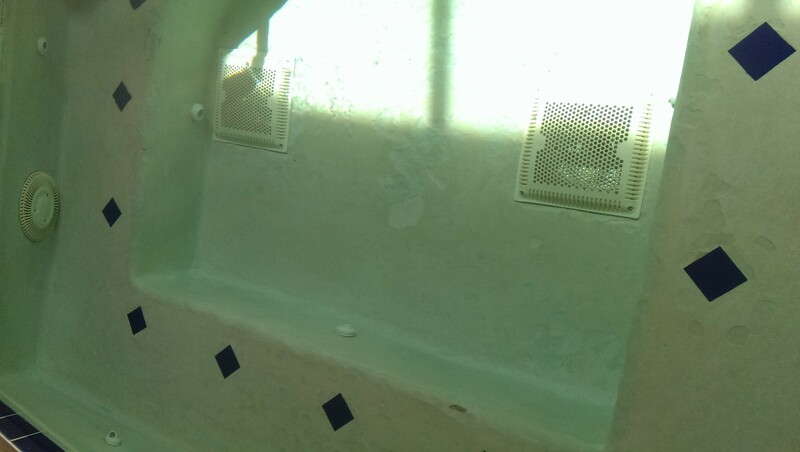 The following photos show one example of a swimming pool that had been completely over laid with fiberglass, and a partial repair was made, successfully. So, if the plaster has not become too brittle and chalky, a pool with small area(s) of failure can be repaired with the FRL System. It can provide a worthwhile extension to the life of the pool before a complete re-plastering is necessary. However, we would not recommend providing a warranty on these partial repairs. 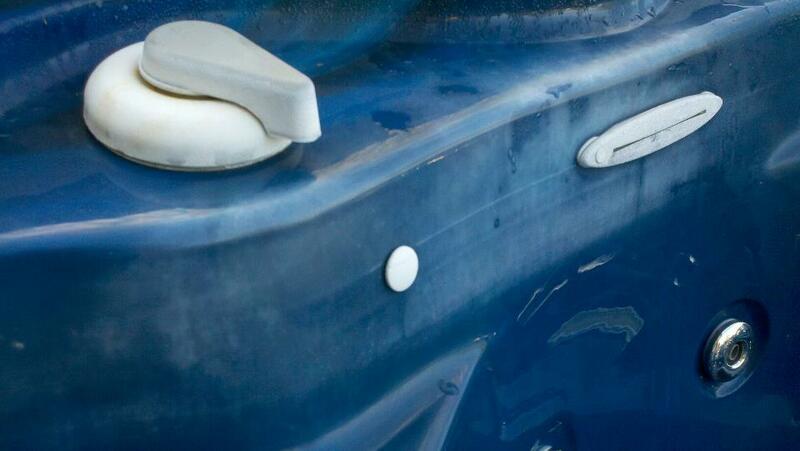 Your hot tub can be refinished with our FRL system. It would require a complete resurfacing of the entire surface (nothing partial). Therefore, you should not commit without a prior inspection of the empty spa. Based on my analysis of your pictures, the glaze layer of the plaster is peeling. This layer is comprised of about .125″ thickness of the total original plaster finish. The glaze was created as part of the total installation process when the plaster was applied during the original construction. 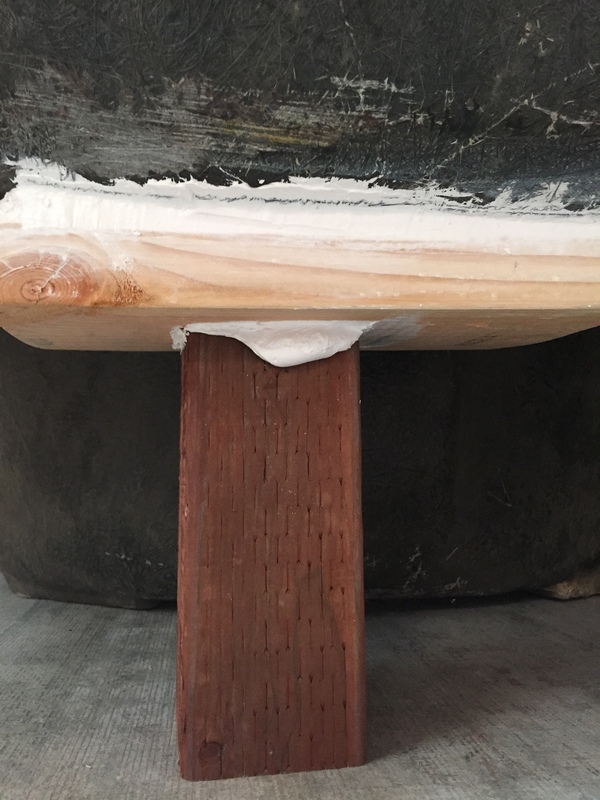 The primary issue in resurfacing with any fiberglass product including our FRL system will be the ability to achieve prolonged adhesion to whatever you are applying it to – in this case the aged glaze or exposed plaster. 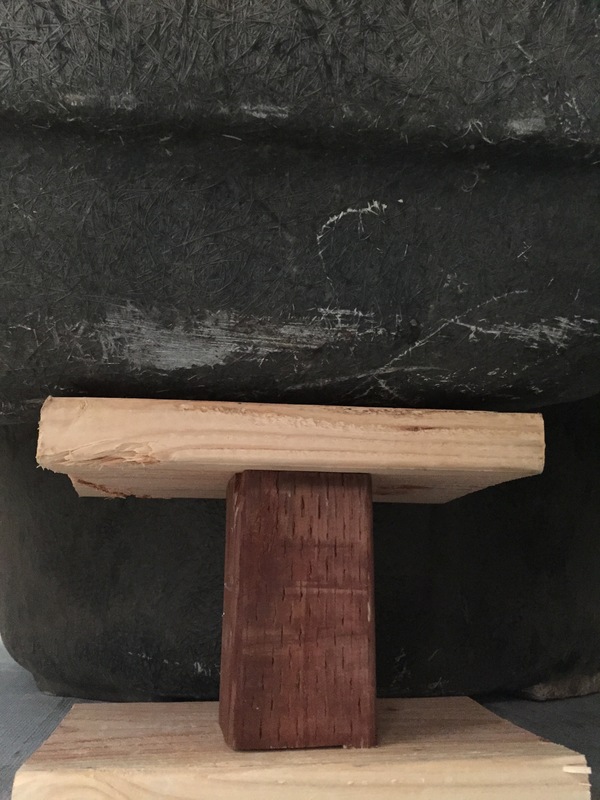 But, if you re-surface the entire plastered hot tub, the FRL resin layer acts as a cap over the plaster, although it does rely on achieving a strong, long-term bond to the substrate. Hot tubs are smaller than pools so as the plaster layers deteriorate, the smaller bonding surface areas stay in place for the long-term. Ideally, the smaller volume allows for sufficient structural strength without the need for the strongest substrate composite integrity. Thus, it will stay in place and function correctly as a capped surface. An inspection would be necessary to determine the condition of the plaster. Plaster fails by becoming brittle and chalky. The core plaster layer is under the glaze and on top of the concrete structure providing the shape of the hot tub. The primary cause for plaster becoming chalky, soft and brittle is from over-use of pool chemicals. So, you should remove the glaze in a few areas, and assess the condition of the plaster underneath, as well. The FRL resurfacing procedure includes grinding and filling the substrate to assure smoothness, and provide a surface that allows the best possible bond with the FRL resin. That process will expose the core while leaving some of the glaze in place. If inspection confirms that the plaster is hard and shows little evidence of brittleness or chalkiness, then a re-surfacing with the FRL system would be advisable. One advantage of the FRL finish compared to a plaster surface is the ease of cleaning. 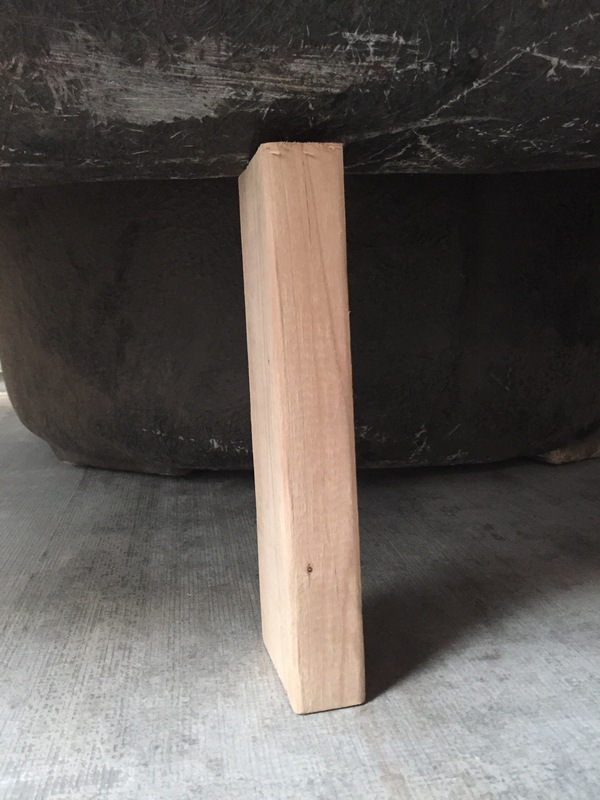 The surface is much smoother, less porous and will be more durable. Important Note: Resurfacing over peeling plaster is risky, and should be attempted only with everyone understanding the issues and potential for success or failure. 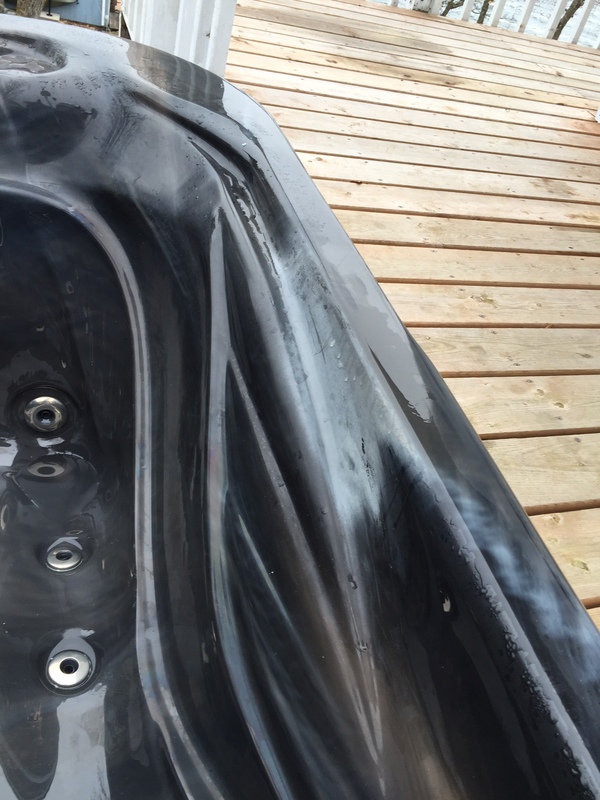 My experience is that plastered Hot Tub resurfacing with the FRL system has yielded long term adhesion and less call-backs when good judgment has been used during inspection and preparation for the refinishing stages. The same judgment should be used when establishing a warranty. Wow, the before and after pictures of this hot tub are incredible. I’m amazed at how well it was repaired. Is an FRL system pretty common? Or do they use that on the newer hot tubs only? I’m just curious because I’ve got a pretty old hot tub that I need to get repaired. If your hot tub is very old, 30 years or more, it is probably gel coat with a FRP backing, and installed in a cabinet or outside deck. This type of product is suited well for resurfacing with the FRL system. Refinishing a gel coat spa will give a permanent finish that will last 10 to 20 years. The same applies to a spa made with an acrylic surface. 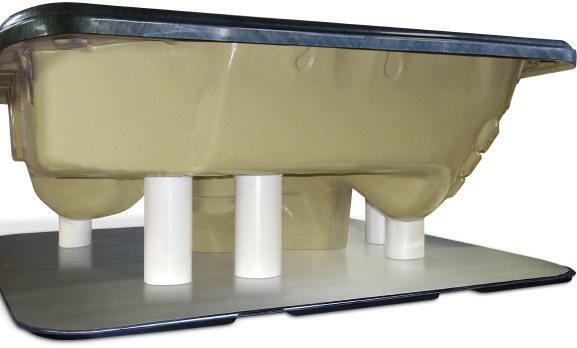 Acrylic spas were introduced in the early 1980’s, and quickly replaced gel coat products, due to superior performance. These were offered as portable spas, but in-ground models were available. Older plastered spas, which are frequently built with swimming pools, can also be resurfaced with the FRL system. The pictures you referred to are actually a pool that was fiber glassed over plaster. Fiber-glassing plastered pools and hot tubs is pretty common. Companies that specialize in this service have come and gone over the years. The business failures have been due to the liabilities from deterioration of plaster as described above. Resins have improved over the years, which have made a difference in how long the new surface lasts. But the main issue is that the plaster fails. 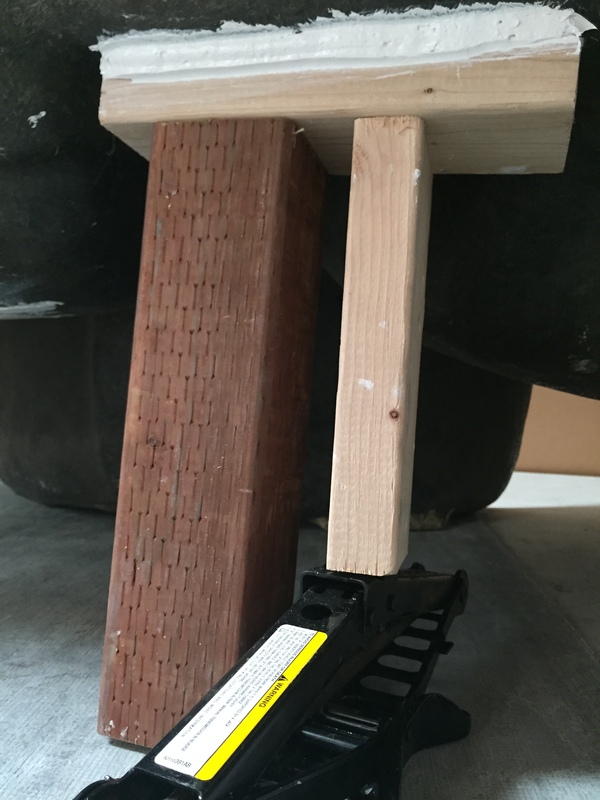 The FRL system is unique, and is designed for surface renewal. It has proven performance in the right application. See the above article for recommendations and limitations. FRP is the acronym for Fiber Glass Reinforced Polyester. This description encompasses a broad range of products with varying levels of quality. The FRL system is designed to be used with numerous surfaces including acrylic, gel coat, ABS, and other spa surfaces. We can refer you to a contractor that has been qualified to perform these applications. Can I paint an acrylic spa/hottub with Zolatone, pool paint or bathtub refinish coatings? I own a spa service company, and I have a customer with a unique problem. He owns a large yacht, which had a spa installed several years ago. It has been abused by failing to keep it covered when not being used. Also, it may have been exposed to the wrong water maintenance chemicals over the years. It is extremely faded, and has crazing and cracking in some areas of the acrylic surface. Since it is still functional, and would be expensive to remove and replace, the customer is inquiring if there is a simple way to renew the surface color and fix the cracks. He is asking about painting with a pool paint or Zolatone® to match the granite appearance. There are a lot of jets in the spa, and some would be very difficult to remove, if a spraying operation was required. What do you think? I agree with you. The spa is crazed and cracked mainly due to over exposure to the sunlight (i.e. no cover in use). Also, the use of strong water chemicals like Tri-Chlor was probably the major factor in the fading, although the excessive UV exposure contributed. 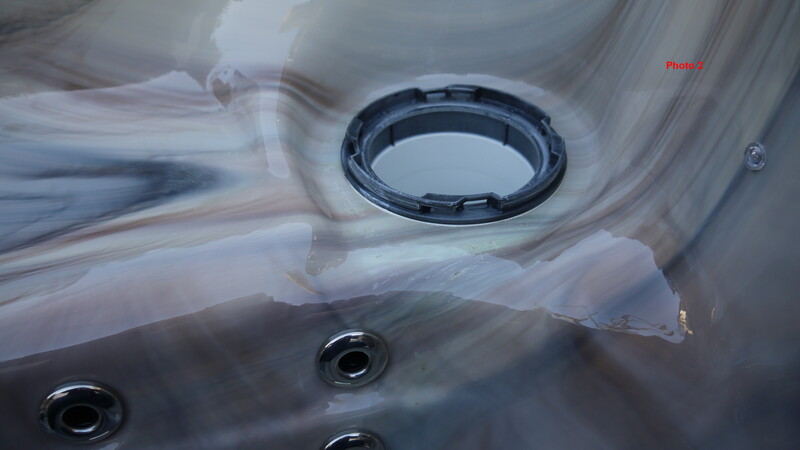 Acrylic sheet manufacturers have confirmed that Tri-Chlor will fade the pigments in acrylic spas and should be avoided for use in maintaining hot tub water chemistry. Tri-Chlor is intended for use in swimming pools. First, Zolatone® is a brand of hybrid lacquer paint, and will peel from a wet environment surface rather quickly. This product, although speckled in color, is intended for top-side and non-wet areas in marine, auto, and industrial applications. 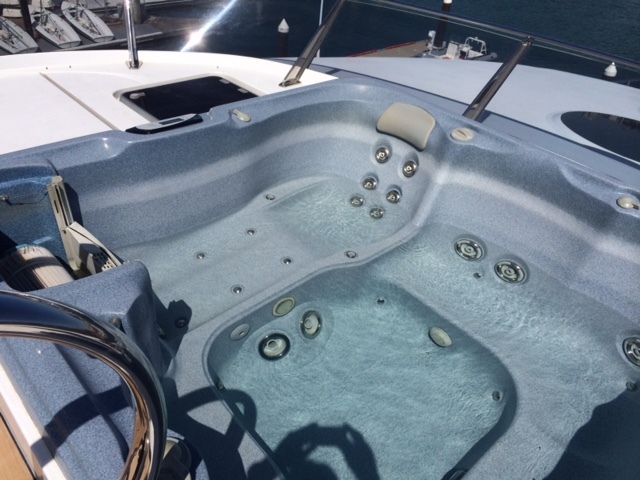 It should not be used below a spa water-line, in tank or wet bilge areas. Even clear coated, Zolatone® will delaminate when painted onto constantly wet and high moisture environments. So, a spa/hot tub refinish is out of the question. 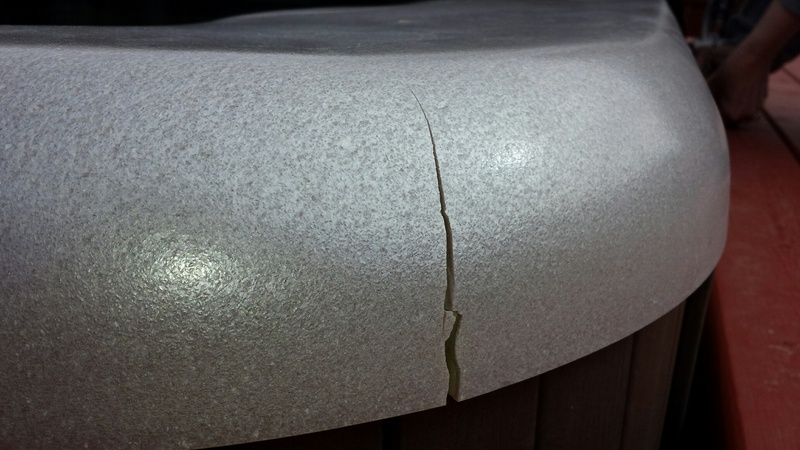 In fact, there is not a coating available that would provide a “quick” fix to renew a crazed/cracked acrylic hot tub surface long term. This even includes swimming pool and bathtub coatings, as well as marine finishes, and let’s not forget gel coat as paint. The reason is that the acrylic surface will continue to crack, craze, expand and contract under the applied painted coating. 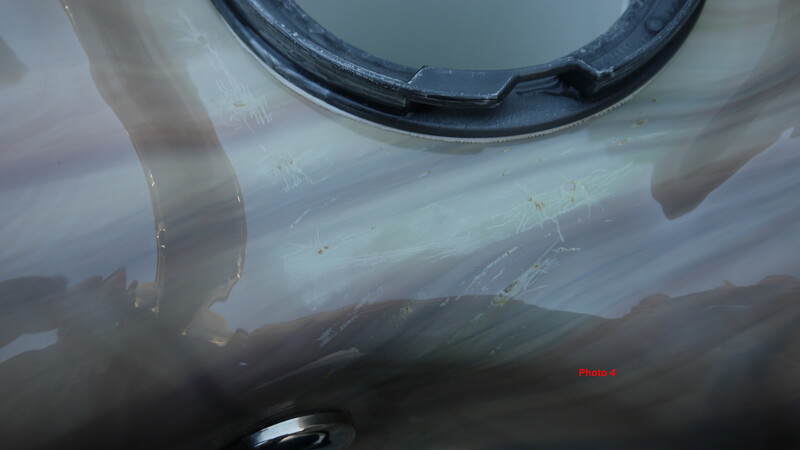 The cracks will simply come through, along with rapid delamination (peeling) of the coatings. These paints are just not made to withstand heated water, constant moisture exposure or chemicals. These factors will cause bubbling and peeling of the coating. However, they do work well when the surface stays dry. 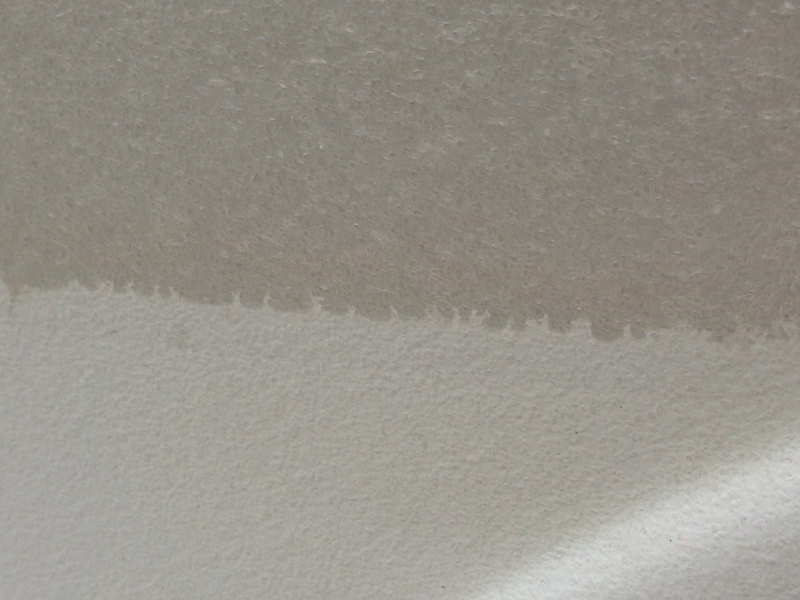 Moisture must dry quickly from these coatings in order to stay pristine, and adhered to the resurfaced substrate. They work well for resurfacing bathtubs. The tub is filled (gets wet), drains (dries) and the surface will continue adhered to the substrate. Overuse, or a dripping shower head or fixture will result in constant wetness and the paint will fail. Furthermore, pool coatings or marine anti-foul paints have an application life of only about 3 years. Therefore, these coatings would have a short life expectancy on a spa in a spa application. 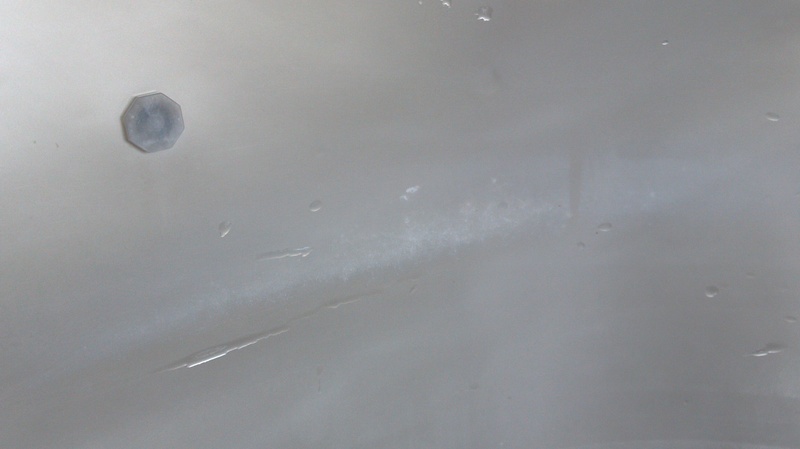 Under spa conditions, we have seen these types of coatings fail within a few months from application. Since there was no commercially available means to meet this need, we developed a process that works, and performs well under normal spa and wet conditions. It is a special resin embedded with glass fiber reinforcement. The reinforcement along with the high performance resin adheres to the original spa structure, and creates a barrier surface with minimal expansion and contraction. The system is laid-up by hand and will give an expected life of 15 to 20 years. We developed this system specifically for spas, tanks and challenging wet areas as a economical method to extend their life. 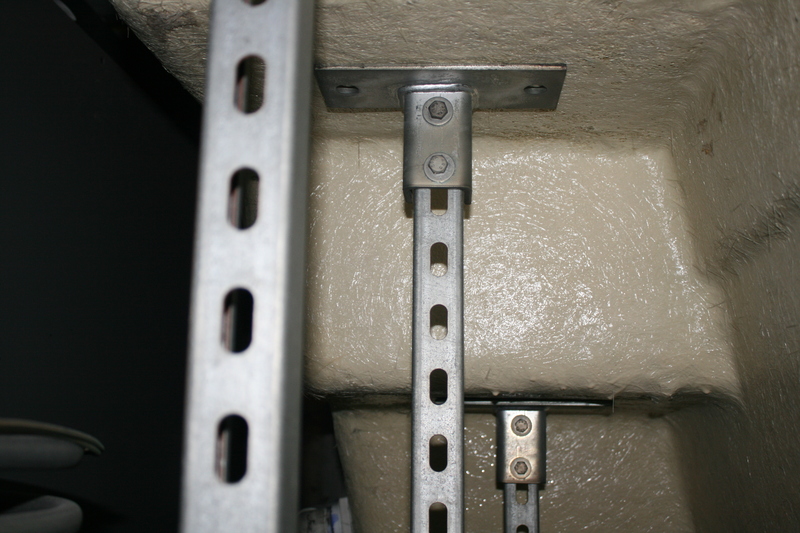 It is our FiberGlass Reinforced Lining (FRL) system. It adds a new reinforced, white colored layer on top of the existing surface or prepared structure. You can see the system components and procedure at the following link. It is contained under the Technical tab in our website. 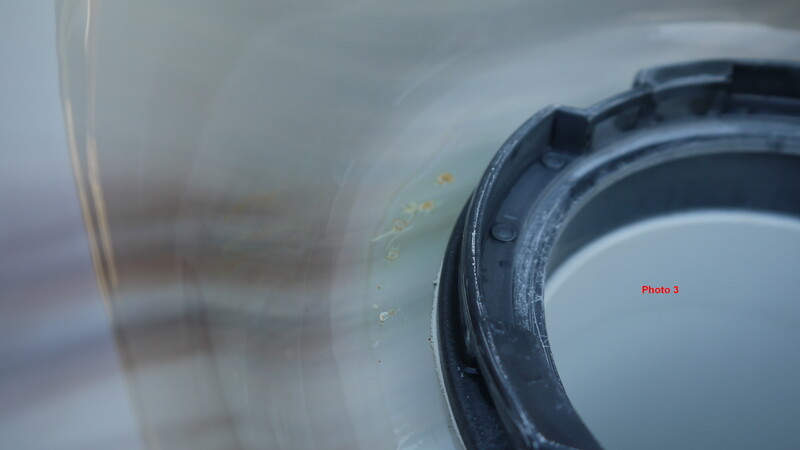 Your application doesn’t require removal of the jets or other fixtures, since the crazed areas on the subject spa do not appear to be causing severe peeling or delamination of the acrylic layer. 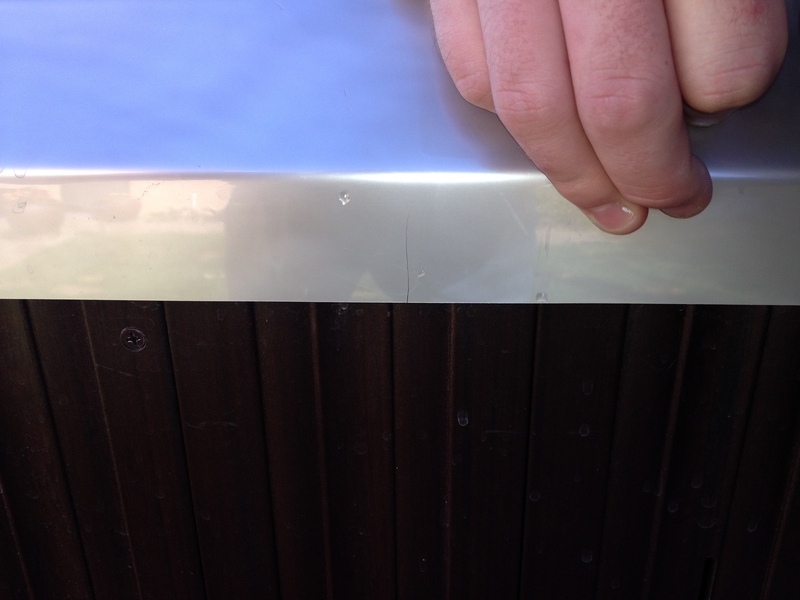 It would not be necessary to remove the acrylic or repair the areas before applying the FRL system. The finished FRL layer will be about 1/8” thick, so it will contribute some additional strength. In other words, it is a structural finish. 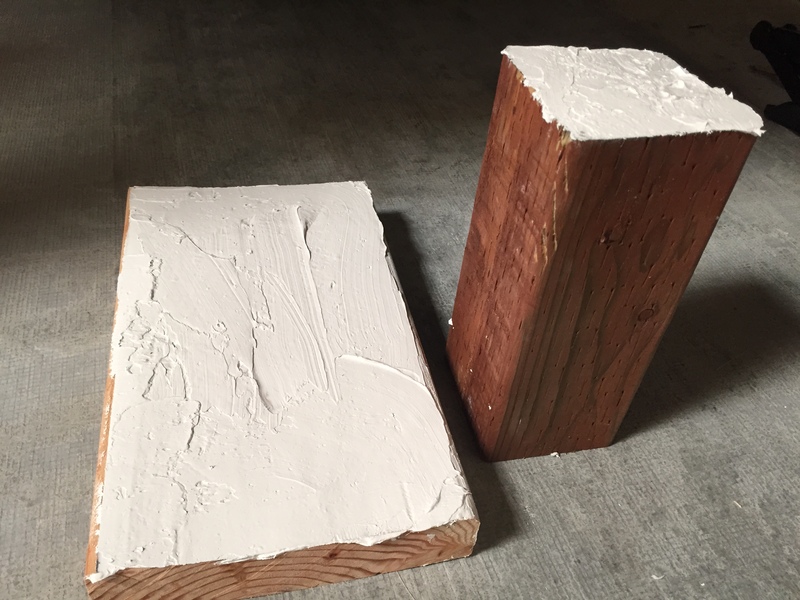 Since the FRL final color coat is white, it will provide an attractive textured finish and appearance that hides the underlying fiberglass throughout the FRL application. It is easy to clean, and is resistant to fading by sunlight. With proper water chemistry maintenance, it will retain its gloss. It has proven to add long term life to spas in these high end settings where replacement was not an easy option. I hope this helps. Our Customer Service Department will help you in ordering the proper kits and materials to do the job. I am a spa dealer with a customer that has reported a problem on the surface of his acrylic spa. 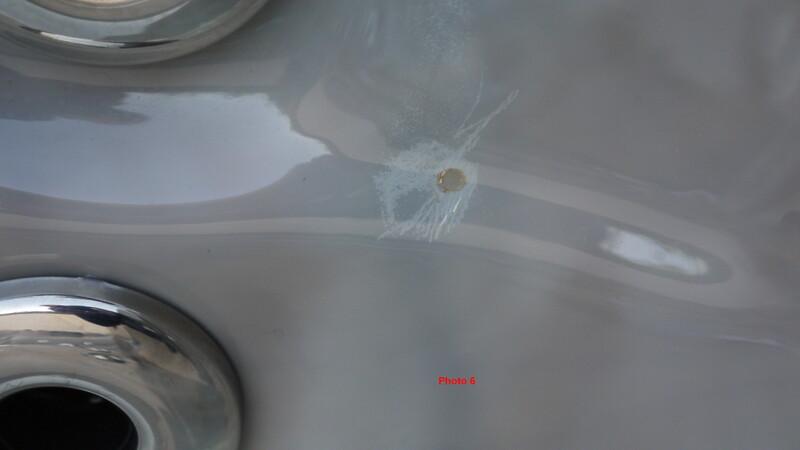 The attached photos show marks appearing on acrylic shell surface. They were in the area around the filter canister, and looked small stone chips that you get on the front end of an automobile. 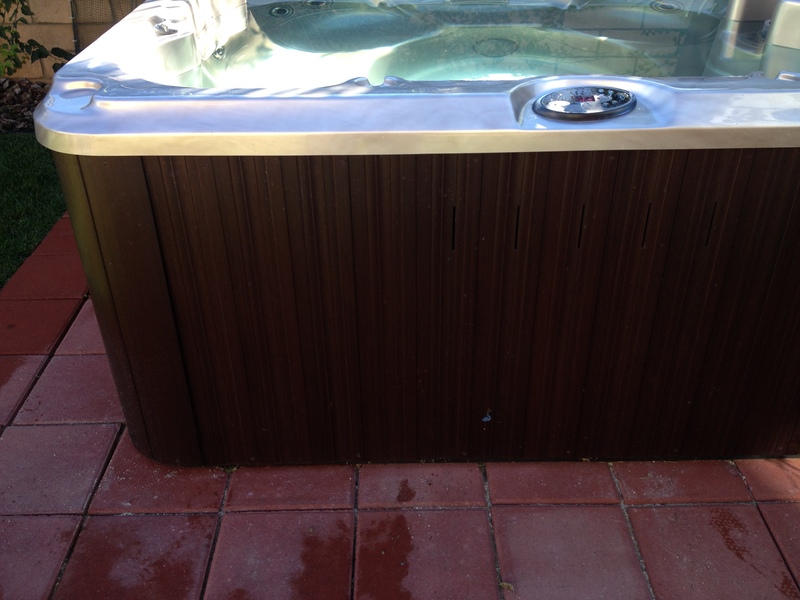 The customer is one off our best on chemical management and takes great care throughout the year to service his tub. Can you take a look at the pictures and give me your thoughts on the potential cause? I have never seen this type of issue on a shell. It’s within about a 12″ area within the filter housing but doesn’t seem to be anywhere else. Could it involve a previous surface repair? 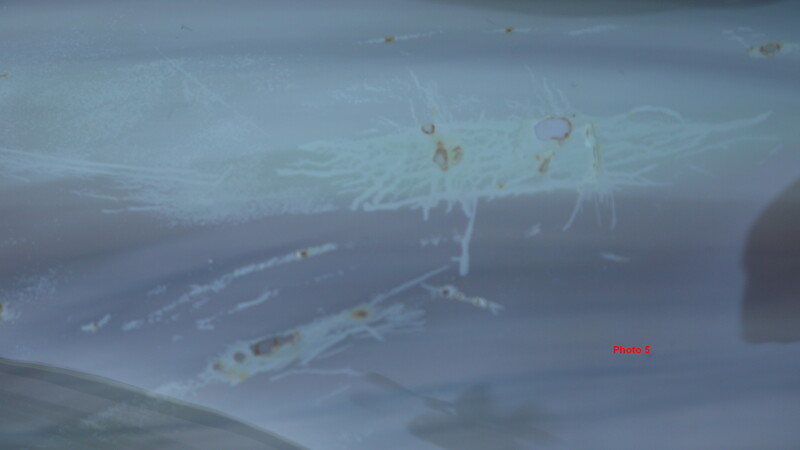 The pictures indicate that this is another example of acrylic pigment fading and/or topical blistering due to exposure to a strong sanitizing agent (oxidizer). Although rare, we have seen several similar examples over the years. One acrylic manufacturer has even been able to duplicate this phenomena in the lab using “Tri-Chlor” tablets. Someone has created this problem with pool chemicals either by using the wrong chemical, or using too much of an approved chemical. The appearance is consistent with what we have experienced with Tri-Chlor. The logical mechanism of your example is that a very strong oxidizing chemical (probably in solid form) sunk into the water, fell down the vertical surface creating surface damage as it sunk into the bottom of the foot well or seat. Acrylic is by far the best material for spa construction, and withstands many harsh conditions, but it is not perfect. Although this type of damage is rare, it suggests that the industry should increase it’s communications on chemicals to avoid, and how to use the recommended ones. There is evidence of extreme chemical dispersion into the filter housing, and it reached a very high localized concentration. 1. A peeling effect of acrylic. This could happen where a tablet would set for a period of time in one spot on the acrylic. 2. A scratching effect. This can be where a large round tablet would float and roll around creating damage to the surface. Or the scraping of chemical damaged or repaired acrylic. 3. Rust in the affected areas. This would be from iron in the water reacting with the oxidizer, and depositing on the porous surface created from the chemical damage. 4. Attack on the silicone in this area also suggests the presence of strong chemicals in the same area. 5. 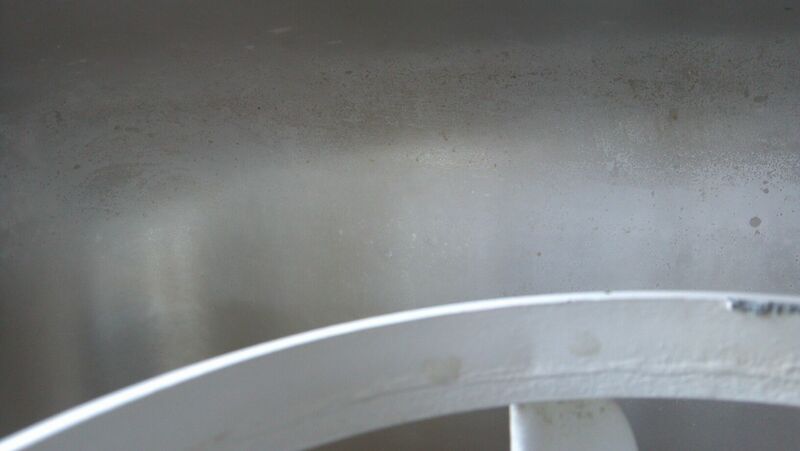 Bleaching of the black filter fixture is an additional indication of chemical oxidation. If there is a repair in this area, the peeling would be of a clear coat. However, the same chemical damage, described above, most likely would have caused the damage to the repair. A pre-existing repair could only be determined by inspection by a repair pro that has experience with chemical damage. The good news is that it can be removed by sanding through the oxidized layer (chemical damage) down to good acrylic. Then it can be buffed and polished to a higher gloss. It will depend on how thick the oxidized layer is, which depends on how long the acrylic surface was exposed to the high concentration of oxidizing chemicals. Hopefully, the discoloration is only “skin” deep. From my experience, it looks like it is less than a 1/16″ (1.6mm) deep. The colors could change as you sand, and become darker or lighter. It would be unpredictable based on the pigment mixing through the sheet. That should not be a big problem since it is in the filter area where it is hidden from view. The gloss would be maintained through the proper buffing and polishing process. If there is a repair, you should find a light-colored filler under the repair coating. In this case, depending on the repair filler depth, it would need repair including a new coating and clear coat for protection. It could have been a surface repair that just covered up a light surface issue, and may buff and polish out to a normal appearance as well. To repair the surface, sand with a progression of 220, 320, 400 grit sandpaper. Finish with 600 grit wet/dry sandpaper. Then to recover the gloss, buff using a high-speed (variable to 2500rpms) with a good quality buffing pad and medium grit buffing compound. We have a video demonstrating the entire procedure, and it can be down loaded. We are occasionally asked what has caused a localized discoloration in a spa. Most of the time, this change in color appears as a bleached surface. There have even been examples where tiny blisters were present in the bleached area In every case we have investigated, the root cause has been localized exposure to a strong sanitizing chemical. The majority of spas are produced from a cross-linked, high molecular weight acrylic polymer sheet, a material that is very resistant to chemicals. However, no product is perfect when it involves chemical resistance. Spas require the use of sanitizing chemicals to maintain water chemistry. Manufacturers provide recommendations on what products to use, and how to use them. Failure to comply with these recommendations can lead to problems. Even if a product might be used in a swimming pool, it may have issues when used in a spa. Pure acrylic is clear with transparency better than most glass. Pigments are added to the liquid acrylic to create the attractive colors and effects. New colors often use exotic pigments. Sanitizers for water are oxidizing agents used to kill bacteria, algae, etc. Some are stronger than others. The most common spa sanitizers are compounds of chlorine or bromine. Some of these products have been found to bleach the acrylic pigments, and cause discoloration. Manufacturers recommendations are always designed to prevent concentrated chemicals from long contact with the acrylic surface, and the plumbing system. Water treatment chemicals for spas are best when in liquid form since they are easier to control concentration. All examples of spa surface discoloration, that have been reported to MTP, have been caused by one of these water treatment products. Inorganic chlorine compounds such as calcium hypochlorite and sodium hypochlorite commonly used sanitizers for swimming pools and spas. However, they are both effected by sunlight, so they require the addition of cyanuric acid to stabilize the chlorine in outdoor pools and spas. Organic chlorine compounds are products combined with cyanuric acid. Sodium dichlorostriazinetrione (“dichlor’) and trichloro-s-triazinetri-one (‘trichlor) are both popular stabilized chlorines for water treatment of outdoor pools. Most of the spa discoloration cases we have seen have been the result of the use of “tri-chlor”. Specifically, they have been due to the use of this chemical in the form of solid tablet. This product dissolves slowly in water, and is a very strong oxidizer as well as increases the acidity of the water. 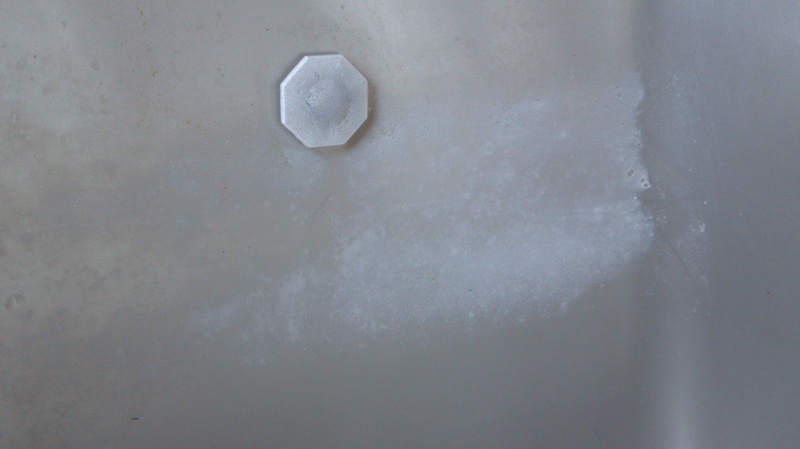 When these tablets are in contact or close proximity to the acrylic surface, it will attack the acrylic pigments and cause bleaching, and sometimes blistering. Di-Chlor is a weaker chemical, and should be the stabilizer of choice for spas and is available in granular form. Furthermore, when any sanitizer or acid is added to spa water, the circulating pump and jets should be running to assure rapid mixing of the chemical into the water. This avoids creating localized regions of highly concentrated chemicals. These problems have been verified by one of the acrylic sheet manufacturers. They performed extensive testing of several water treatment products, and found that ‘trichlor” tablets can cause the bleaching similar to the examples that we have observed and have been reported to us. They also found that when combined with hot water, it would cause blistering. Some cases reported to MTP showed a red, rust-like material in the bleached area. Their tests duplicated this phenomena when there was a source of iron in the water. High concentration of the oxidizing chemical is a prerequisite for the discoloration. This is facilitated by tablet form chemicals, since they can lay on the acrylic surface while dissolving. If water is not being circulated, there will be a very high concentration at the interface of the acrylic and the tablet. The two photos above show discoloration and blistering from the incorrect use of chemicals like “tri-chlor”. Some people like to use floaters with a chemical inside. Although it is a convenient way to treat water, it is not recommended, since it can cause problems. The floater can rest against the side of the spa, and since it is in close proximity, it can cause bleaching of the surface. Poor chemical control can also cause problems within the plumbing system by reacting with sealants, o-rings, etc. There have been reports of other spa components being compromised the use of bromine sanitizers, and ozonators (direct ozone addition). Any chemical should be quickly dissolved and diluted with water to avoid problems. It is very important for a spa owner to maintain total water chemistry (e.g. pH, chlorine, total solids, etc) as recommended by the manufacturer. Various problems can occur if chemistry gets out of control. For example, if chlorine level is too high the vapors can bleach the under surface of a spa cover. Excessive chemicals in water can also damage the jets, controls and fixtures. Check with your manufacturer for their recommendations on how to maintain water chemistry in your spa. Sometimes, the bleached surface can be removed by sanding and re-polishing, so surface appearance can be recovered. However, avoid repeating the factors which caused the original discoloration. Following are some photos that provide examples to chemical bleaching (chemical burns). The owner of at least one of these samples reported seeing pits in the bleached area. There are chemicals that have been known to attack cross-linked acrylic. One example is Wintergreen oil. Although, the normal mode of failure from chemical attack on an acrylic surface is stress cracking, failure can occur in various ways. 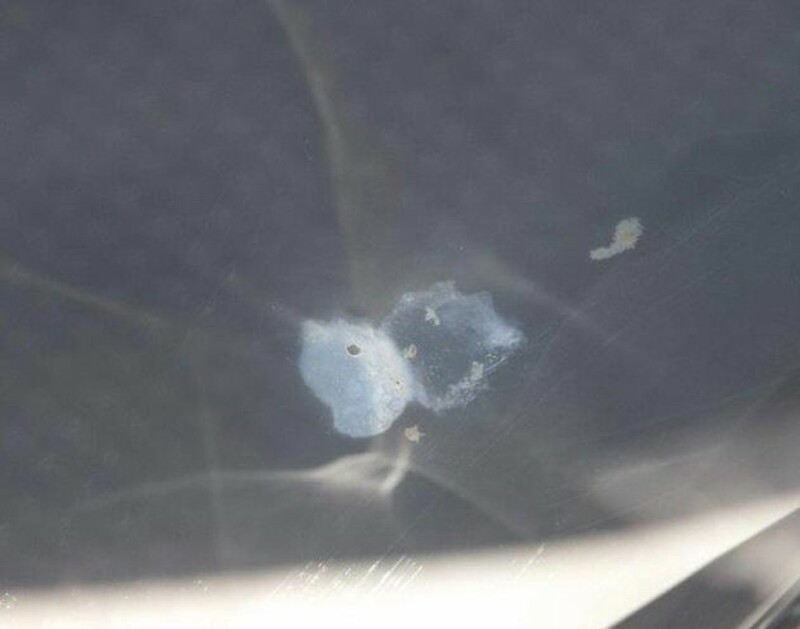 Failure in a spa caused by wintergreen oil have been seen where it looked like a liquid had been poured on the surface , and it ran down the side. The acrylic was discolored, and microscopic crazing was present. Refer to information on stress-cracking in the website, http://www.multitechproducts.com. So, unless a chemical has been approved for use in a spa, avoid using it. The pictures above illustrate these problems in solid color and marble (multiple colored patterns) color spas. 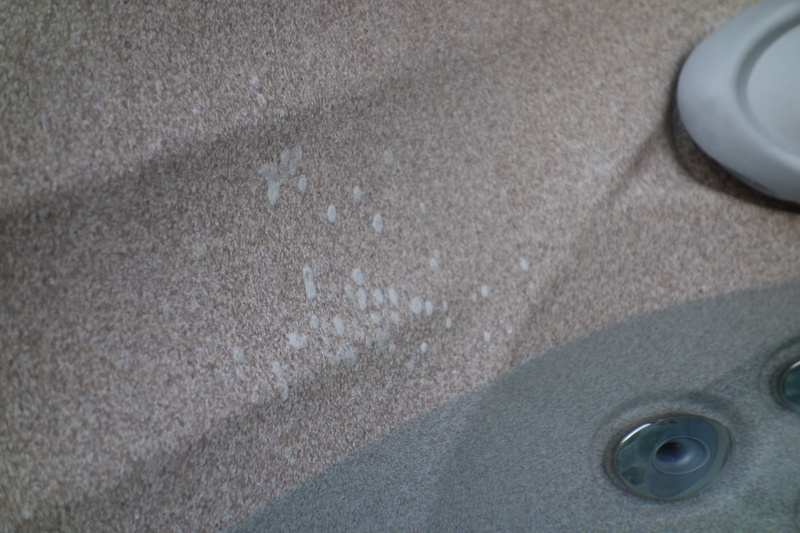 The apparent defect can also occur in “granite” spas as shown below. Again, they can be repaired using a sanding procedure. You would start by using 80 or 100 grit sandpaper until the discolored area is removed, and you see the original color. Then you would finish by using 320 grit wet/dry paper, and finally 400 grit. If granite texture needs to be regained, you can use Multi-Tech Products K2000 clear topcoat with a brush. Use the procedure provided to add texture. 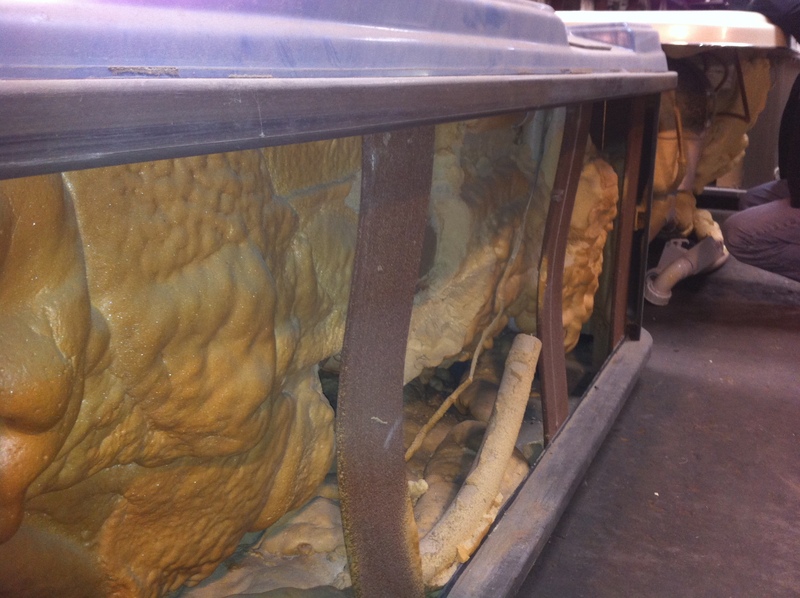 The picture below gives an example of the worst case of chemical attack we have seen on an acrylic spa. This severe, widespread discoloration would not lend itself to sanding, buffing, and polishing to recover the original color(s). Read the message at the link for more information on cause and refinish options on this case. applied directly, it may cause a temporary cloudiness. Direct applications should be broadcast evenly over the water surface to avoid bleaching. This chemical, when contaminated by or mixed with an organic compound, can produce a fire. A good rule is never to mix calcium hypochlorite with another chemical or store it in anything but the original container. Mix the chemical into water not water into the chemical. 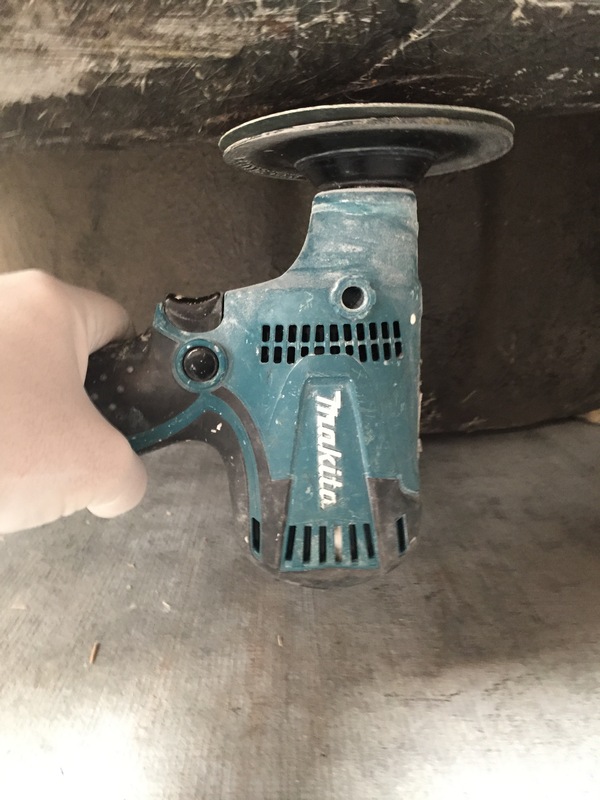 Calcium hypochlorite should not be handled with bare hands and must bekept off the operator’s clothes. As a chlorinating agent, calcium hypochlorite will slightly increase water pH. It’s pH is 11.8. Sodium dichloro-s-triazinetrione and trichloro-s-tria zinetrione – chlorine compounds that contain cyanuric acid, and are used to stabilize chlorine. The dichlor is more soluble and provides 56% or 62% available chlorine, depending on formulation. The dichlor compound has little effect on pH, while trichlor is extremely acid (pH 2.8 -3.0). Dichlor can be added directly to the water. The major effect of cyanuric acid on hypochlorous acid (HOCI) is to keep it from being decomposed by ultraviolet light contained in sunlight. Because it is readily decomposed by LTV light, the dosage of a chlorinating agent loke calcium hypochlorite that is sufficient for an indoor pool/spa is dissipated rapidly in an outdoor pool/spa. Cyanuric acid bonds with the available chlorine in a manner that does not use up the chlorine. At high stabilizer levels (over 100 ppm), chlorine’s efficiency may be reduced. The operator should consult the local codes and manufacturers’ recommendations on the proper use of stabilizers. What causes Fading in an Acrylic Spa? I am a spa dealer in Arizona, and I have a customer asking about extreme color fading in their 15 years-old, in-ground acrylic spa. I have attached a photo. What would cause this to occur? Would spa chemicals be a likely culprit? Please help. Yes, your photo confirms a problem with extreme color fading. There are two common causes of fading in an acrylic spa. Pure acrylic is transparent, so pigments are added to achieve the attractive colors and effects. These pigments are subject to fading from over exposure to chemicals and to a lesser degree sunlight For example, it has been proven that high concentrations of chemicals like “tri-chlor” can completely bleach out spa surfaces. UV light from the sun can also be a contributing factor. Your spa may be suffering from a combination of both problems. 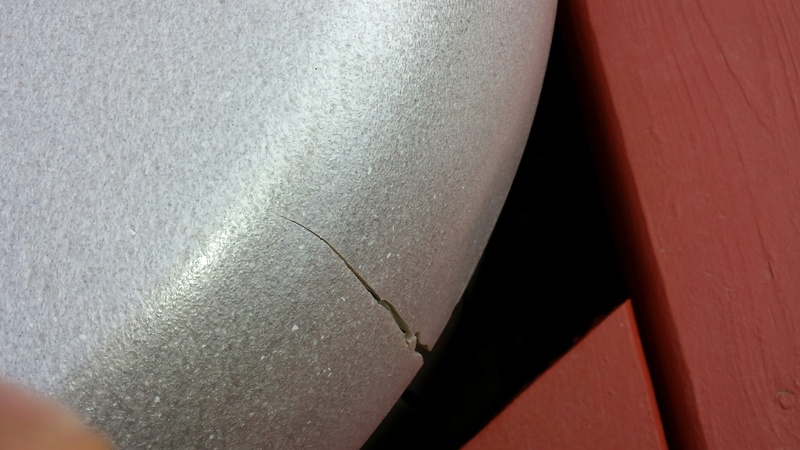 The cracks around the top edge are evidence of excessive exposure to the sun’s heat. The sun’s radiant energy can result in very high acrylic surface temperatures during the day. The cracks form as a result of repeated expansion and contraction from large swings in temperature from daylight to night. This occurs frequently when a cover is not used when the spa is not in use. If you look closely, the entire top surface is covered with cracks and crazing. See our crazing blog entry below. Manufacturers insist on the use of a cover when the spa is not in use. This is required to prevent cracks and crazing. 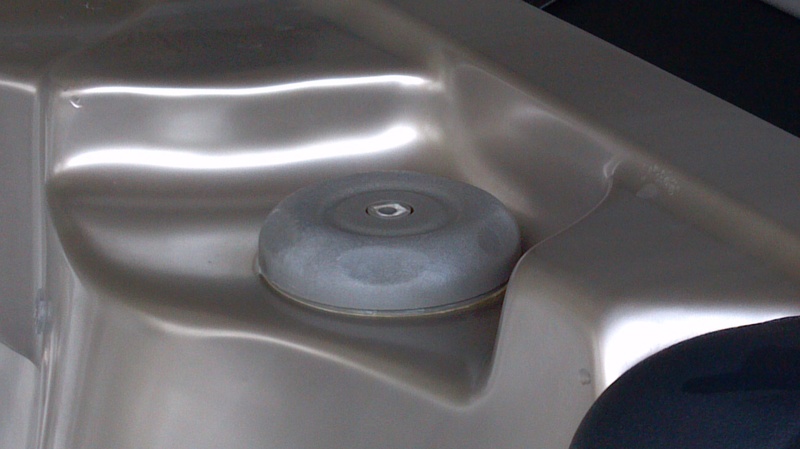 Most manufacturers will void a warranty when a spa cover is not used routinely. See the “Why use a Spa Cover blog entry”. It describes more on crazing. Fading like your example would require years of exposure to strong sunlight, therefore, I believe excess sanitizing chemicals in the water is the prime cause of the fading. Your case is the worst example of chemical/sunlight fading that I have personally seen in my 25 years’ experience. You should also read the following blog entry. Early fading is usually limited to a thin layer on the surface. In these cases it can be removed by sanding, buffing, and polishing the surface. However, eliminate the source(s) of the problem. Refer to our procedures in the website, or our Buffing and Polishing DVD for instructions on renewing the gloss on the surface. You asked about chemicals used to maintain water chemistry. Since they are strong oxidizing agents, it is a logical question. First, if these chemicals are used properly, there will be no issue. Some exceptionally strong oxidizers can create problems. For example, it has been shown that high concentrations of “tri-chlor” in hot water can cause severe bleaching in acrylic spa surfaces. Spa owners who use this chemical in the tablet form have real problems with fading, since they can rest on the acrylic surface, and dissolve slowly. A high concentration of the chemical exists at the immediate area surrounding the tablet. When chemicals are involved, the fading is generally at the water line. Generally speaking, we have witnessed very few issues with acrylic due to any of the common spa chemicals, which include bromine, chlorine, and ozone. Acrylic is an outstanding product for spas, and has fewer problems than any material ever used for them. But your photo shows what can happen when the spa is abused, and manufacturer recommendations are ignored. Thanks for the great advice on this spa. However, do you think it can be salvaged?